This week i made Quiche. I enjoyed making the pastry and the filling consisted of frying up bacon and onions and then whisking together 2 eggs, single cream, salt and pepper. The pastry had plain flour, butter and water and all I had to do was knead it like I was making bread. It is a very tasty quiche and would make a nice lunch with salad. 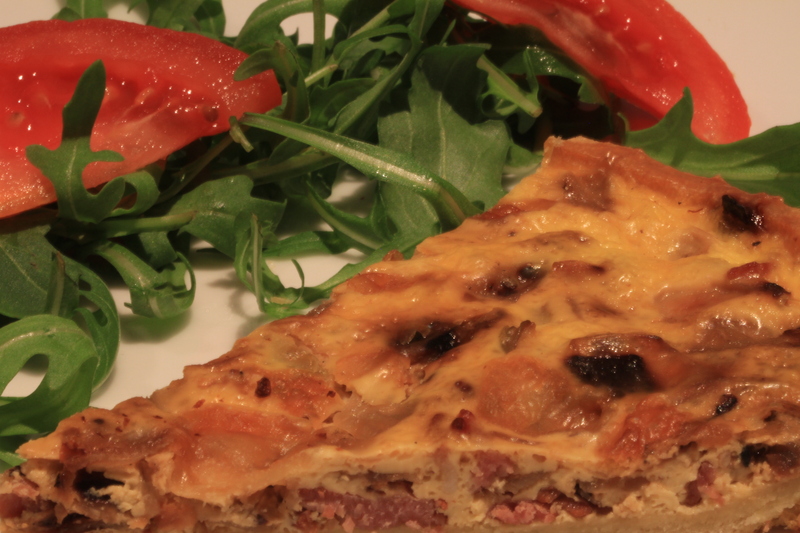 Quiche lorraine is an open pie with a filling of custard with smoked bacon or lardons. Cheese can be added and some Quiche Lorraine recipes also include ham. Quiche Lorraine is thought to be a French dish but it actually came from Germany. The word ‘Quiche’ is from the German word ‘kuchen’, meaning cake. Looks very, very tasty, Moo. Lovely to see you both last weekend, and hope to see you again soon. Moscow is slowly warming up, but hasn’t started to go spring green yet.